Rex Ryan is a 'disrespectful b'*****ard" New York Giants running back Brandon Jacobs told ESPN after the Giants routed the new York Jets. Jacobs is right ---but he may also called Ryan 'fat boy' according to a Newsday reporter. Ryan is certainly setting the NFL on fire for all the wrong reasons. He talks trash all week and never delivers is the sum of it. How many times has he had the Jets on their way to the Super Bowl only to find a team far too good for him? Even when he came to the Jets one of his first comments was that the team would be going to meet the president soon as Super Bowl champions. 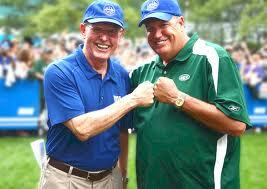 Trash talk is great Rex, but sooner or later you have to live up to it. Looking at the woeful Jets yesterday they have clearly gone in the wrong direction. The promise of Mark Sanchez last year has dissolved into the truth that he is a very ordinary quarterback unable to throw deep. Ryan insists on talking him up as the next Joe Namath however. Its all fine unless your bluff is called. And it certainly was on Sunday by the New York Giants. As Tom Coughlin essentially said 'Shut up and play the game' after Ryan's midweek rants. When they did Ryan was wiped out. Not for the first time -- or last I think.